If you’ve ever driven out to the Hamptons from New York City, you’ve seen Linda Scott’s six-story tall sculpture known as “Stargazer.” The sculpture, is a rendition of a deer that is looking up at the sky, is located on the east side of Manorville Road just to the north of where those coming from the city on the Long Island Expressway turn onto Route 27. Linda Scott, who lives in Southampton, is an artist through and through. She was educated at Sarah Lawrence College, Harvard University and Skowhegan School of Painting and Sculpture, and studied privately with Nicolas Carone. Her credentials as an artist and sculptor are impressive. Many of the sculptures that Scott has done sit in the vast backyards of the rich in the Hamptons who thoroughly enjoy her work and tell this story to their friends. Scott has sold some of her work to very well-known people and celebrities, including Steven Spielberg, Andy Warhol and Paul Mellon. She has also been involved with building designs, including a building at Cornell University. Not surprising, Scott has been asked many times about the meaning of the Stargazers. Originally, the very large Stargazer now located in Manorville was commissioned by the Animal Rescue Fund (ARF) as entrance for their East Hampton location near the airport on Daniel Hole’s Road. Stargazer would straddle the driveway, and cars would drive through its legs. 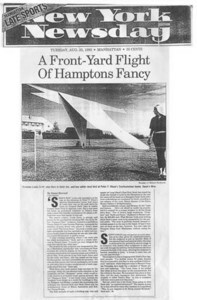 But when Scott finished the sculpture, the Town of East Hampton Building Department refused to allow it to be erected because of political pressure from the Town Board and members of the public who felt that the sculpture was dangerous to be so close to the East Hampton airport-pilots coming in for a landing might be distracted by it. Without a home for Stargazer, Scott began to look elsewhere. And soon, thanks to the generosity of a kindly farmer and the benevolence of the town of Brookhaven in whose district the farmland exists, Stargazer found its home on Manorville Road. When that vandalism occurred, though, the community came out offering financial support to effectively restore the massive sculpture. Lynch, the owner of the Hampton Jitney, has not only offered up financial support but is also covering two of his Jitneys with images of the Stargazer wrapped all around them. On the side of each Hampton Jitney, Scott will be identified as the artist, and John Jaxheimer, the head photographer at Sports Illustrated, as the photographer. “He is just absolutely fabulous,” said Scott. “Everybody thinks that I’m a lunatic for putting that piece out there and taking care of it for 20 years. But I am a lunatic, so there,” she said. Linda has set up a website, www.lindascott.org, where she can be contacted about keeping this beautiful piece of artwork in good condition. 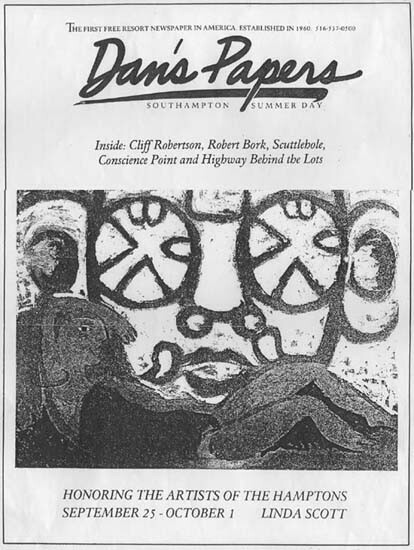 And so, when you drive by the Stargazer and marvel at what has come to be perceived by many as a gateway to the Hamptons, you can know that the general viewing public has enabled the life’s work of one woman in the Hamptons to proceed. She, in turn, is committed to keeping her heart and soul focused on this project so that it may be enjoyed by all, far into the future. If we try and think about the things that are the “Hamptons” to us, each individual’s list would be quite different. For some the spots would include East Hampton beaches and restaurants and for others Westhampton ice cream shops. But in trying to come up with things that we all have in common, that tie us together, Route 27 comes to mind. It is the lifeline through all of the Hamptons, all the way out to Montauk Lighthouse from Manorville where Route 111 carries the Hamptons traffic south onto Route 27. And it is at this road, that a lankmark sculpture sits. The Stargazer–most people don’t know that’s what it is called–that red, looming sculpture of a deer stretching and holding an antler. Of the few that know its name, fewer still know how it got there, and in fact, some people cannot even identify what the sculpture is because of its Calder-esque abstraction. But motorists notice the Stargazer each time they travel through that intersection of 111 and 27. It is where the Hamptons begin. And whether people like it or not, the Stargazer is a landmark and a gateway to the East End. It is our first sign that we are near the beach. It is a prominent piece of public art that we all share–and it is in trouble. The costs to maintain Stargazer are falling primarily on a few donors and the artist, and resources have run staggeringly low. “It is the first place coming east on my drives from Manhattan that I could truly smell the ocean and that’s why we put it there,” says the artist Linda Scott. 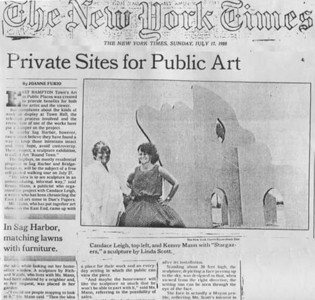 She was trying to find a home for Stargazer back in 1991. 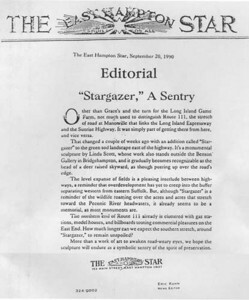 And the farmer Harvey Pollock agreed to allow Scott to display Stargazer on his property. “You can have it here for fifty or more years,” he said to her. And since then it has been a struggle to maintain Stargazer and keep it looking good. Stargazer was originally commissioned by ARF (Animal Rescue Fund) and Scott was hired to create an entrance for their offices in East Hampton on Daniele Hole Road near the airport. It had to be tall enough for cars to drive through and wide enough to stradle a two-lane road. But when the construction was complete–six stories of wood, stucco and steel–ARF backed out because of pressures from the town supervisor and its proximity to east Hampton Airport. People were worried that the deer’s head might obstruct the runway from planes trying to land there. With Stargazer temporarily homeless, Linda Scott asked for community support to help her find a home for the piece. 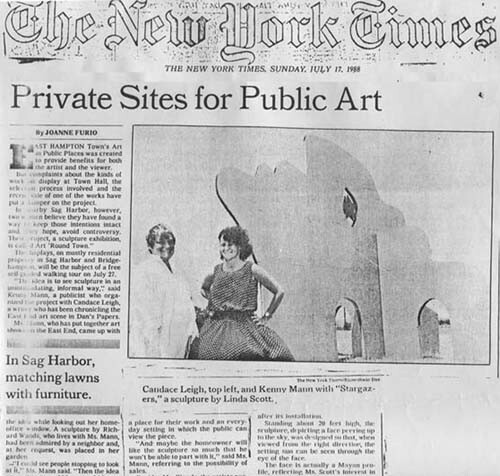 She called upon many prominent members of the community, but public art cannot always survive on the largesse of a few well-to-do people’s efforts alone. Sometimes it takes things being threatened for people to value them. 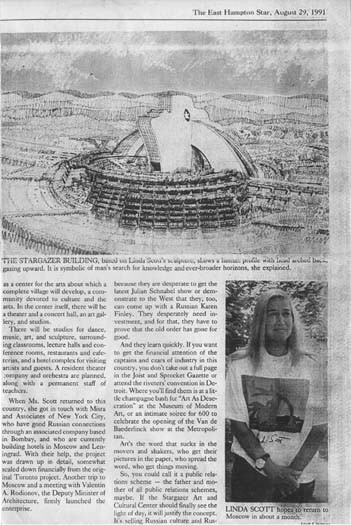 In 1996, when Stargazer was vandalized with gray paint and holes were punched in its wooden exterior, people took notice. 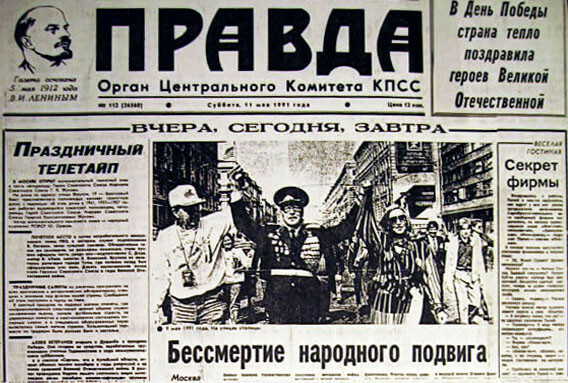 The sight of that valdalism was enough to rally some community suport and funding. Riverhead Lumber Supply donated the man-hours to help paint the structure. 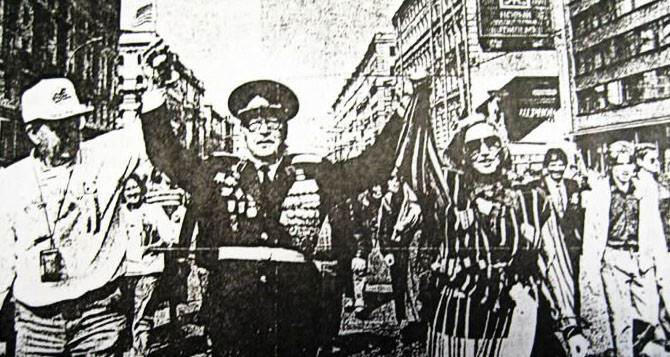 Individuals contributed, but a substantial portion of the financial burden fell on the artist herself–a burden she was hard-pressed to bear. 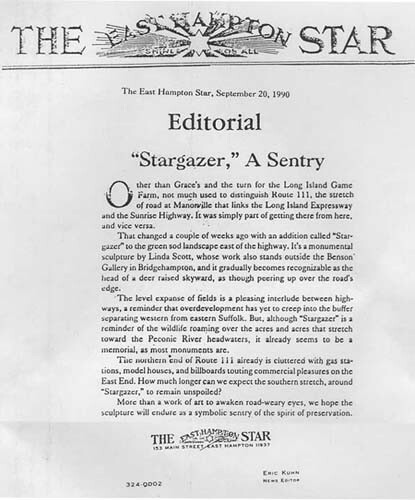 The plight of Stargazer and the desire of Linda Scott, “to find a corporation to purchase it and help with its maintenance,” recalls the story of the Statue of Liberty when it was first erected in the 1880s. Both America and France turned to the general populous to donate money to pay for the exorbitant costs of Liberty’s construction. 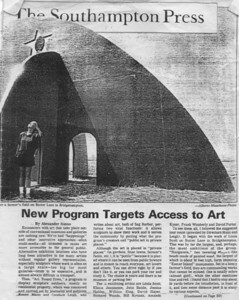 It is a beautiful story, looking back at how it all came about… Essentially it became an issue of public responsibility, as is often the debate and question when it comes to public art. Joseph Pulitzer used his paper The New York World as a means to rally support for Lady Liberty… Linda Scott has consulted with some of the world’s most famous architects on public Spaces… The board of advisors that has been assembled to rally support for Stargazer include: Dan Rattiner, William McCreery, The Griffith Foundation, Councilman Steve Kenny, Leonard Riggio, The Albright Knox Museum, Steven Spielberg and Mr. And Mrs. Harvey Pollack. The group is hoping to use their influence to enlist others in the cause. If a resolution is not found and money raised soon, the upkeep of Stargazer will suffer which could change the aesthetic of the sculpture entirely. Linda Scott says that she is tired, frustrated and unsure of the future of her work. The Hamptons could lose an important landmark–and a commonality that we all share. 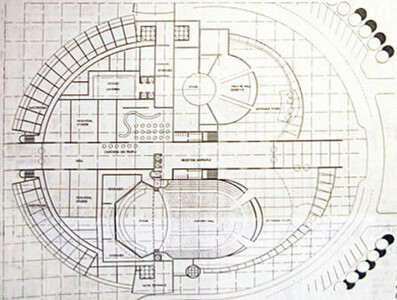 Stargazer Project is committed to the fusion of art, architecture and the environment in public spaces. They welcome gifts of any size, just like they did with Lady Liberty. by Dan Rattiner excerpts from Dan’s Papers, July 14, 2000. 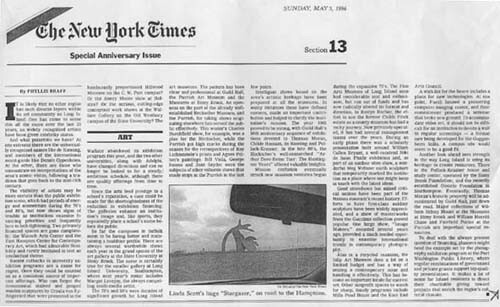 Linda Scott’s six story high sculpture Stargazer in the farm at the end of Manorville Road, has remained a visible, triumphal archway welcoming people to the Hamptons for more than ten years. 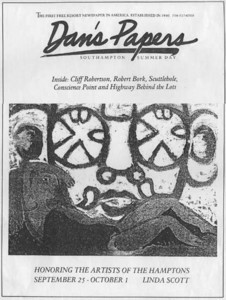 People go past it, notice that it is designed as a magnificent deer eating a branch of a tree, make a left onto the Sunrise Highway and in five or ten minutes, turn off to Westhampton Beach, the first of the Hamptons. Stargazer has been painted several times and about three years ago was vandalized and had to be repaired, but it has become an icon, almost as much as the Montauk Lighthouse or the Statue of Liberty or any other well known monument in these parts. Now the monument is in trouble, its future in doubt… Linda had done other sculptures, much of heads of people looking skyward. Some were sixty or seventy feet high. She’d been inspired and had the advice of Robbie Young who had built the Skydome in Toronto, and of Richard Roth, who had built the World Trade Center. That was then however, and this is now. And the trouble that Stargazer is in, is that Linda Scott can no longer afford to maintain it. For inquiries into corporate sponsorship of the Stargazer Deer please contact Linda Scott. To celebrate the millennium the Stargazer Deer, “Gateway to the Hamptons” Landmark underwent a renovation the later part of June. With this new renovation we are happy to acknowledge the support of Mr. Mike Lambrese of Dryvit, Rhoade Island who donated all the red paint. Richard Ely of Richard Ely Trees is donating his help and his bucket truck. The amazing Pastor Gasper Anastasi of the Word of Life Ministries supplied the help of several men. We hope to look all fresh, new and inspiring for all. All efforts are profoundly appreciated.